Give your kitty the nutrition he craves and thrives on with the Nutro Max Adult Salmon Flavor Dry Cat Food. Made with chicken and salmon, it packs plenty of animal-sourced protein to fuel all those indoor adventures. The formula is loaded with antioxidants for a healthy immune system, essential taurine for vision and heart health, omegas for a shiny coat, and a balanced blend of vitamins and minerals. Plus, it’s formulated with a kitty-approved flavor and kibble shape that’ll have your pal running to his bowl every time. 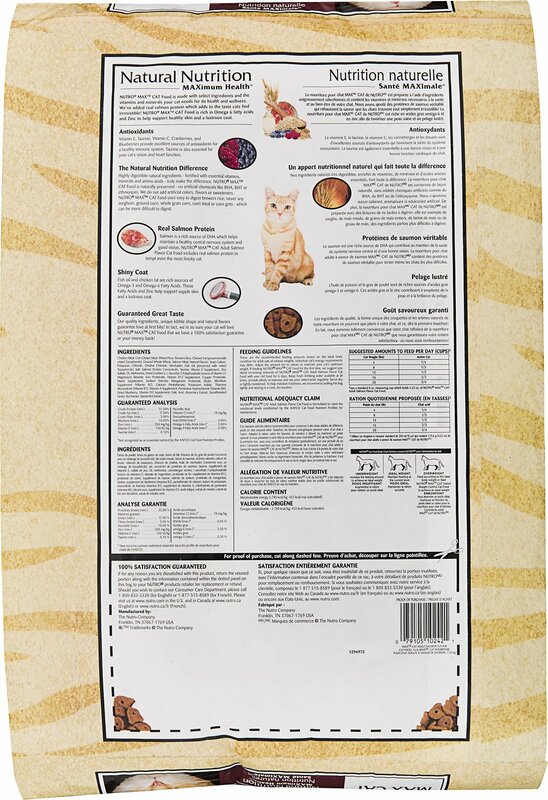 Adult kibble formula is made with chicken and salmon for the high-quality animal protein cats need. Chicken Meal, Corn Gluten Meal, Wheat Flour, Brewers Rice, Chicken Fat (Preserved with Mixed Tocopherols), Ground Whole Wheat, Salmon Meal, Natural Flavors, Yeast Culture, Potassium Chloride, Choline Chloride, Menhaden Fish Oil (Preserved with Mixed Tocopherols), Salt, Salmon Protein Concentrate, Taurine, Vitamin E Supplement, Zinc Sulfate, Dl-Methionine, Dried Cranberry, L-Ascorbyl-2-Polyphosphate (Source of Vitamin C), Magnesium Stearate, Iron Proteinate, Vitamin B12 Supplement, Copper Proteinate, Niacin Supplement, Sodium Selenite, Manganese Proteinate, Biotin, Riboflavin Supplement (Vitamin B2), Calcium Pantothenate, Potassium Iodide, Thiamine Mononitrate (Vitamin B1), Vitamin A Supplement, Pyridoxine Hydrochloride (Vitamin B6), Dried Blueberry, Vitamin D3 Supplement, Folic Acid, Rosemary Extract, Decaffeinated Green Tea Extract, Spearmint Extract. They eat a lot if dry food and this never seems to get old to them. They are healthy and have beautiful coats. The most recent order of four bags of dry food were given to a friend who feeds three feral colonies of cats. On a good day there are about forty or more cats around. Even better days are when she can trap some of these cats and take them to the vet for spaying or neutering. My two cats were adopted from her and this is my way of giving back to her and the work she is doing. 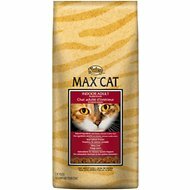 I have 3 cat's they love this cat food very few recalls if any. I trust this food will definitely be ordering more . Order was filled immediately and delivered the next day! I didn’t have to drive to a pet store and lug a 16 pound bag of cat food home! Very convenient and Chewey had exactly what I was looking for. I have 2 cats and they usually always eat all of their food, I decided to try this cat food, one will not touch it and the other barley eats it. My kitties love MAX CAT! Always feed them the chicken flavor trying this flavor for the first time. 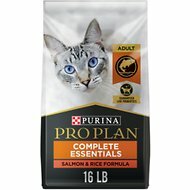 The cats love this food. I fill the bowl and in 5 minutes, it is all gone. The cats really like this food. The Nutro Max Cat dry food is what my cat loves, and ordering it from Chewy is great, you get it almost the next day, which makes my Buddi very happy. thank you. My cat is getting up there in years. But he does very well with this food. He loves it. We have several semi-feral cats that we feed. We have fed them Nutro Max for as long as we have had them on our property. They are 13 years old and have never had any sort of health issues. And, the delivery from Chewy has made our care for these feral so much easier!